Traumatic encephalopathy has emerged as a significant public health problem. Itis believed that traumatic encephalopathy is caused by exposure to repetitivebrain trauma prior to the initial symptoms of neurodegenerative disease.Therefore, prevention is important for the disease. The PI3K/AKT/PTEN(phosphoinositide-3 kinase/AKT/phosphatase and tensin homologue deleted onchromosome 10) pathway has been shown to play a pivotal role in neuroprotection,enhancing cell survival by stimulating cell proliferation and inhibitingapoptosis. 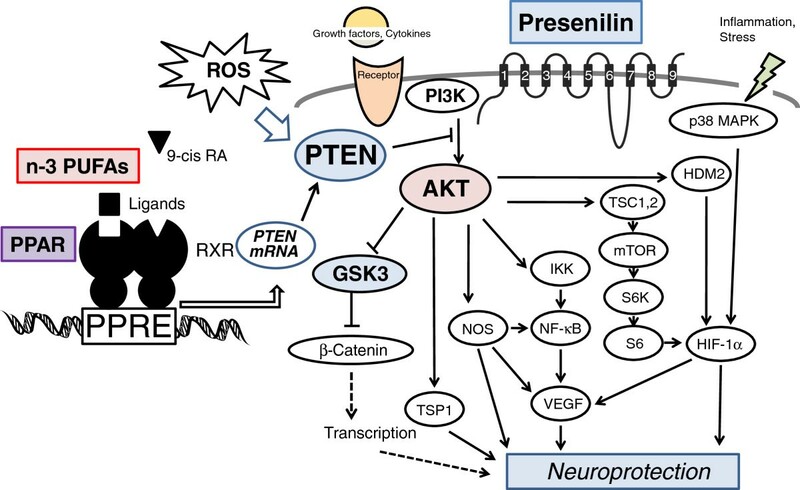 PTEN negatively regulates the PI3K/AKT pathways through its lipidphosphatase activity. Although PTEN has been discovered as a tumor suppressor,PTEN is also involved in several other diseases, including diabetes andAlzheimer’s disease. Dietary fish oil rich in polyunsaturated fatty acidsmay induce the PTEN expression by activation of peroxisomeproliferator-activated receptor. Supplementation of these natural compounds mayprovide a new therapeutic approach to the brain disorder. We review recentstudies on the features of several diets and the signaling pathways involved intraumatic encephalopathy. Traumatic brain injury is a major health problem throughout the world and is aleading cause of mortality and disability [1, 2]. The consequent encephalopathy is a complicated pathological process;however, the main cause of the deleterious cascades may be cell damage inmitochondria at the cellular level . Reactive oxygen species (ROS), caspases, and apoptosis may be the mainparticipants in the mitochondrial cell damage. Traumatic brain injury is associatedwith permanent spatial learning dysfunction and motor deficits due to brain damage . No pharmacological therapies have yet been approved for the treatment oftraumatic brain injury. The possibility of an effective treatment could be based onthe fact that the majority of traumatic neurodegeneration is due to apathophysiological cascade after the injury that exacerbates the damaging effects ofthe injury. One of the validated mechanisms revealed in experimental traumatic braininjury involves oxygen radical-induced oxidative damage to lipids, proteins, andnucleic acids [3, 5]. Developing new therapies for traumatic brain injury requires elucidationof the neuroprotective mechanisms . The ROS are generated during mitochondrial oxidative metabolism as wellas in cellular response to pathogens, which act as signaling molecules and regulatevarious physiological processes, including proliferation, differentiation,apoptosis, and migration [6–8]. In addition, protein and lipid oxidation by ROS is proposed as a crucialdeterminant of brain health. Nicotinamide adenine dinucleotide phosphate (NADPH)oxidase is a complex that produces ROS during the ischemic period, which is also amajor source of endogenous ROS that comes from mitochondria during the process ofoxidative phosphorylation to produce energy in the form of ATP . NADPH oxidase-generated ROS are also implicated in the development ofangiotensin II-dependent hypertension mediated through the hypothalamic neurons . In addition, ROS are produced by intracellular membrane oxidases.Inflammation is a source of ROS at the sites of tissue. It is important for cells toneutralize ROS before they can damage cellular macromolecules. One mechanism bywhich ROS are thought to exert their effects is through the reversible regulation oftarget molecules such as protein kinase C, mitogen-activated protein kinase,phosphoinositide-3 kinase (PI3K), tyrosine phosphatase, and phosphatase and tensinhomolog deleted on chromosome 10 (PTEN) . However, less is known about the initial regulation of signalingmolecules by ROS. Cellular ROS metabolism is tightly regulated by a variety ofproteins involved in the redox mechanism. Traumatic brain injury is a devastating neurological injury associated withsignificant morbidity and mortality. The prevention of brain dysfunction intraumatic encephalopathy is a public health concern because of a lack of effectivetreatments. Several potential preventive factors, including modifiable lifestylefactors such as diet, have been suggested by epidemiological research . It has been demonstrated that dietary choices can play a key role in theneuroprotection of traumatic encephalopathy . However, the epidemiological analysis of the relations between nutrientconsumption and neroprotection is complex, and it is unlikely that a singlecomponent plays a major role. The complexity of human diet, especially the highsynergistic or antagonistic correlation among the effects of various nutrients andfoods, makes it difficult to examine their distinct effects. Because many factors inlife influence brain function, several interventions might be promising in theprevention of brain dysfunction in traumatic encephalopathy. The main objective ofthis article is to review the studies linking potential protective factors topathogenesis of traumatic encephalopathy, focusing on the roles of polyunsaturatedomega-3 fatty acids (PUFAs) and curcumin in the PI3K/AKT/PTEN pathway. We willsummarize the current research into mechanisms by which several diet factors bind tothe interaction partners to transduce signals downstream and the implications forthe disease-associated biology. Studies indicate that prevention of traumatic brain injury-induced ROS productiondecreases blood–brain barrier disruption, neuronal death, and microglialactivation, which may have high therapeutic potential to reduce traumatic braininjury-induced neuronal death . In addition, a number of studies have demonstrated an antioxidantrole for tumor-suppressor proteins, activating the expression of someantioxidant genes in response to oxidative stress. Tumor-suppressor genesregulate diverse cellular activities, including DNA damage repair, cell cyclearrest, cell proliferation, cell differentiation, migration, and apoptosis . PTEN is a tumor-suppressor gene that is frequently deletedor mutated in a variety of human cancers. It has been demonstrated thatupregulation of PTEN causes modulation of PI3K/AKT signaling to reduce ROSgeneration in cells . Phosphatidylinositol 3,4,5-triphosphate (PIP3) is the major secondmessenger of the PI3K pathway that mediates receptor tyrosine kinase signalingto the survival kinase AKT. PTEN negatively regulates the activity of PI3K/AKTsignaling by converting PIP3 to PIP2 (phosphatidylinositol 4,5-bisphosphate).Increased levels of PIP3 at the membrane cause PH domain-containing proteinssuch as AKT to co-localize, resulting in the kinase-mediated phosphorylation andactivation . The activated AKT phosphorylates target proteins involved in cellsurvival, cell cycling, angiogenesis, and metabolism for neuroprotection(Figure 1). A role for PI3K/AKT signaling insynaptic scaling is suggested by the findings that inhibition of PI3K blockshomeostatic AMPA (α-amino-3-hydroxy-5-methyl-4-isoxazolepropionic acid)receptor delivery to synapses . A clear dissociation between AKT and ribosomal S6K signaling markerscould be involved in the brain pathological process . The phosphorylation of presenilin 1 (PS1) downregulates itscell-surface expression, which leads to an impaired activation of the PI3K/AKTcell survival signaling. The PS1 also regulates induction of hypoxia-induciblefactor-1α . Accordingly, the abnormal activation of glycogen synthasekinase-3-beta (GSK3β) can reduce neuronal viability . In other words, selective downregulation of the AKT concurrent withelevated GSK3β activity may be linked to brain dysfunctional pathogenesis . Recently, it has been shown that AKT activation may play atherapeutic role in neurodegenerative diseases [22, 23]. Schematic representation and overview of PTEN/PI3K/AKT signaling and amodel of the mechanism of peroxisome proliferator-activated receptor(PPAR) action. Similar to other nuclear hormone receptors, PPARsact as a ligand-activated transcription factor. PPARs, in response toligand binding, hetero-dimerize with retinoid-X-receptor (RXR) and bindPPAR response element (PPRE) DNA sequences in the promoters of targetgenes, including PTEN. The uncontrolled generation of reactiveoxygen species (ROS) might contribute to cell proliferation byinhibiting PTEN function. Examples of molecules known to act on thePTEN/PI3K/AKT regulatory pathways are also shown; these molecules mayrelate to the function of presenilin. Hammerheads mean inhibition. Somecritical pathways have been omitted for clarity. GSK3, glycogen synthasekinase-3; HDM2, human homologue of murine mdm2; HIF-1α,hypoxia-inducible factor-1α; IKK, IκB kinase; MAPK,mitogen-activated protein kinase; mTOR, mammalian target of rapamycin;NF-κB, nuclear factor-kappa-B; NOS, nitric oxide synthase; PI3K,phosphoinositide-3 kinase; PTEN, phosphatase and tensin homologuedeleted on chromosome 10; PUFA, polyunsaturated fatty acid; RA, retinoicacid; TSC, tuberous sclerosis complex; TSP1, thrombospondin 1; VEGF,vascular endothelial growth factor. The tumor suppressor PTEN, which antagonizes the PI3K/AKT pathway, has beenrecognized to play a key role in neural functions. Its level has been found tobe reduced in Alzheimer’s disease (AD) brains [23, 24]. PTEN negatively regulates the activity of PI3K/AKT signaling byconverting PIP3 to PIP2. The PIP3 is the principal second messenger of the PI3Kpathway that mediates receptor tyrosine kinase signaling to the survival kinaseAKT. 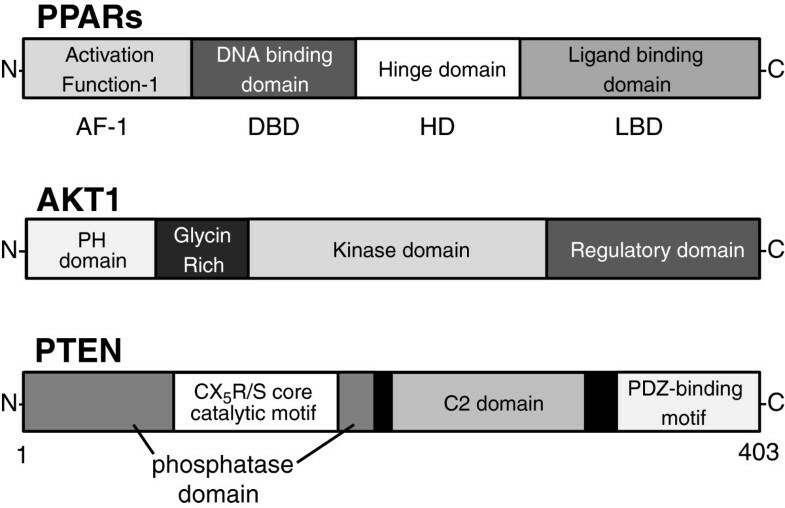 Increased levels of PIP3 at the membrane cause PH domain-containingproteins such as AKT and PDK-1 to co-localize, resulting in the kinase-mediatedphosphorylation and activation . Schematic structures of the AKT and PTEN protein are shown inFigure 2. The activated AKT phosphorylates targetproteins involved in cell survival, cell cycling, and metabolism. Cell cyclemediators affected by AKT and PTEN include the forkhead transcription factorsand GSK3 [25, 26]. PTEN acts as a regulator of maintaining basal levels of PIP3 below athreshold for those signaling activation. PTEN also plays an important role inthe induction of apoptotic cell death signals in cells when cells lose contactwith the extracellular matrix . Presenilins may play an important role in signaling pathwaysinvolving PI3K/AKT and PTEN that are crucial for physiological functions and thepathogenesis of AD . PTEN may also be involved in a disease state such asParkinson’s disease . Schematic structures of human PPAR, AKT1, and PTEN protein. Thepredicted consensual domain structures for each protein are depicted.The sizes of protein are modified for clarity. C2 domain, a structuraldomain involved in targeting proteins to cell membranes; PDZ, a commonstructural domain in signaling proteins (the abbreviation stands forPSD95, Dlg, ZO-1); PPAR, peroxisome proliferator-activated receptor;PTEN, phosphatase and tensin homologue deleted on chromosome 10. A wide variety of compounds have been identified as peroxisomeproliferator-activated receptor (PPAR) ligands. The n-3 PUFAs have a beneficialeffect on most of the metabolic risk factors by regulating gene transcriptionfactors, including PPARα and PPARγ . Treating cells with the insulin-sensitizing drug pioglitazone, aPPARγ agonist, attenuates the ROS signaling pathway . Correcting insulin signal dysregulation in traumatic brain injurymay also offer a potential therapeutic approach. A schematic protein structureof the PPARs is shown in Figure 2. Ligand-activatedPPARs bind as heterodimers with the retinoid X receptor (RXR) on PPAR responseelements, which are present in the promoter regions of the responsive genes  (Figure 1). Retinoic acid also affects abroad spectrum of physiological processes, including cell growth,differentiation, morphogenesis, reproduction, and development , through the action of two types of receptors: the retinoic acidreceptors (RARs) and the RXRs. The transcriptional control by the PPAR/RXRheterodimer also requires interaction with co-regulator complexes . Thus, selective action of PPARs in vivo results from theinterplay at a time point of each of the co-factors available. A number of PPARtarget genes have been characterized. Combined treatment with agonists for theheterodimeric binding partners of PPARγ and the RXRs shows additiveenhancement of the amyloid-beta (Aβ) uptake that is mediated by RXRαactivation . Simultaneous activation of the PPARγ/RXRα heterodimer mayprove beneficial in prevention of traumatic brain injury. Furthermore,PPARγ represents a signaling system that can intercede to restore neuralnetworks . It has been reported that oral administration of the RXR agonist,bexarotene, to a mouse model of AD results in enhanced clearance of solubleAβ . Furthermore, bexarotene stimulated the rapid reversal of cognitivedeficits and improved neural circuit function. Accordingly, RXR activation maystimulate physiological Aβ clearance mechanisms. Activated PPARs upregulate expression of PTEN (Figure 1). Type-2 diabetes is characterized by diminishedpancreatic β-cell function. Insulin signaling within the β-cells hasbeen shown to play an important role in maintaining the function of theβ-cells. Under basal conditions, enhanced insulin-PI3K signaling viadeletion of PTEN leads to increased β-cell mass . Mice with PTEN deletion in pancreatic cells show an increase in theβ-cell mass because of both increased proliferation and reduced apoptosis.In particular, the relationship between PTEN function and adipocyte-specificfatty acid-binding protein FABP4 is of interest in β-cell signaling . The interaction of PTEN to FABP4 suggests a role for thisphosphatase in the regulation of lipid metabolism and cell differentiation . Tissue-targeted deletion of PTEN leads to improved insulinsensitivity in the insulin-responsive tissues and protects from diabetes . On the other hand, ligands of PPARs are used as oral anti-diabetics . The PTEN is ubiquitously expressed throughout earlyembryogenesis in mammals . Interestingly, rosemary extract represses PTEN expressionin K562 leukemic culture cells . The schematic structure of the PTEN protein is also shown inFigure 2. PTEN protein consists of N-terminalphosphatase, C-terminal C2, and PDZ (PSD-95, DLG1, and ZO-1) binding domains.The PTEN CX5R(S/T) motif resides within an active site that surrounds thecatalytic signature with three basic residues, which are critical for PTEN lipidphosphatase activity. The structure endows PTEN with its preference for acidicphospholipid substrates such as PIP3. Neuroprotection by inhibiting PTEN hasbeen reported by activating the anti-apoptotic PI3K/AKT pathway in primaryneurons [45–47]. Curcumin, a component of turmeric, potently lowers Aβ levels in adose-dependent manner. Furthermore, in vivo studies indicated thatcurcumin was able to reduce Aβ-related pathology in mouse models viaunknown molecular mechanisms . In addition, curcumin can improve structure and plasticity ofsynapse and enhance their learning and memory abilities . The protective effect of curcumin is associated with a significantattenuation in the expression of interleukin-1b, a pro-inflammatory cytokine . Curcumin also reverses the induction of aquaporin-4, an astrocyticwater channel implicated in the development of cellular edema after brain trauma . Curcumin blocks IL-1b-induced aquaporin-4 expression in culturedastrocytes by reduced activation of the p50 and p65 subunits of nuclearfactor-kappa-B. Interestingly, curcumin enhances synaptic plasticity andcognitive function after fluid percussion injury in rats , suggesting that curcumin may represent a potent therapeutic agentthat exerts multiple beneficial effects after traumatic brain injury. It issuggested that the neuroprotection of curcumin might be mediated via PI3K/AKTsignaling pathway . 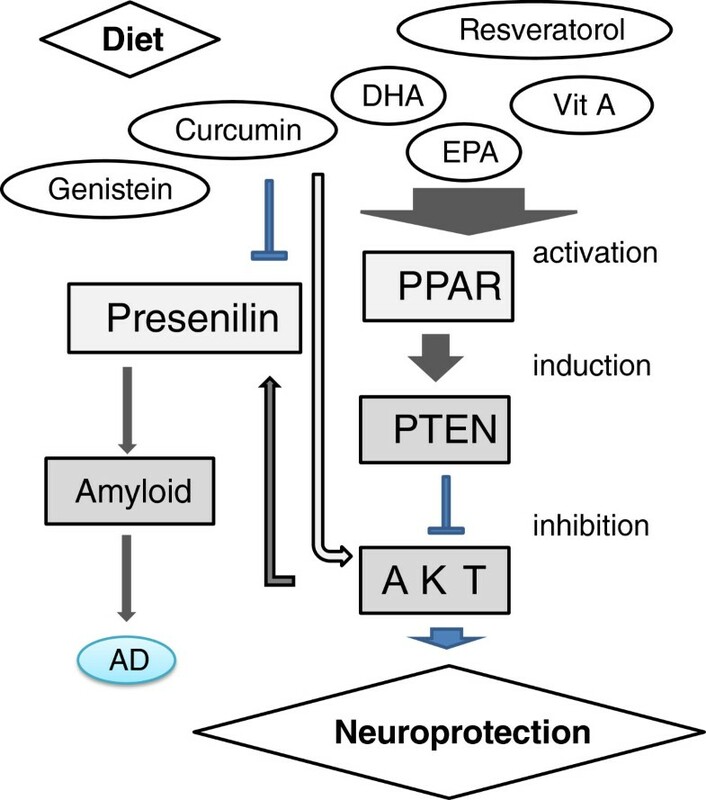 Dietary treatment with curcumin, fish oil, or a combination of bothhas the potential to improve c-Jun N-terminal kinase signaling, phospho-taupathology, and cognitive deficits in AD . Genistein, a phytoestrogen present in high concentrations in soy, alsodownregulates presenilin via the inhibition of ubiquilin 1 expression inlymphoid cells . Genistein has potent anti-tumor activity in various cancer cells. Inaddition to the inhibition of tyrosine kinases, genistein has a strongestrogen-like effect, which is also beneficial for the plasticity of AD . Genistein potentiates the anti-cancer effects of gemcitabine inhuman osteosarcoma via the downregulation of the Akt pathway . Resveratrol also appears to be beneficial as an anti-AD agent [57–60]. Resveratrol treatment also prevented the pro-inflammatory effect offibrillar Aβ on macrophages by potently inhibiting the effect of Aβ . The n-3 PUFAs are a family of biologically active fatty acids, whichhave a range of physiological roles that relate to optimal cellular functions.The simplest member of this family, α-linolenic acid, can be converted tothe biologically more active long-chain n-3 PUFAs such as eicosapentaenoic acidand docosahexaenoic acid. Several works have led to the identification ofvarious PPAR ligands that include the n-3 PUFAs [62, 63]. In addition, linoleic acid and γ-linolenic acid could bindPPARδ very well . All distinct PPAR subtypes, PPARs (α, β, and γ),share a high degree of structural homology with other members of the superfamilyin the DNA-binding domain and ligand-binding domain. PPAR-ligands are emergingas potential therapeutics for inflammatory and other metabolic diseases. The useof n-3 PUFAs has been shown as a possible preventive measure for AD [65–68]. Retinoic acid affects a variety of physiological processes throughthe action of RAR and RXR. Stimulation of the RARα signaling pathway offerstherapeutic potential by clearing Aβ for the treatment of AD . Retinoic acid plays a key role in the adult brain by participatingin the homeostatic control of synaptic plasticity and is essential for memoryfunction. Retinoids are vitamin A derivatives involved in cellular regulatoryprocesses, including cell differentiation and neurite outgrowth, which may alsoinfluence Aβ processing . Thus, neuroprotecton could be performed by certain diets(Figure 3). Implication of certain diets in neuroprotection via modulation of thefunction of PPARs, PTEN, AKT, and presenilin. AD,Alzheimer’s disease; DHA, docosahexaenoic acid; EPA,eicosapentaenoic acid; PPAR, peroxisome proliferator-activated receptor;PTEN, phosphatase and tensin homologue deleted on chromosome 10. Increased ROS can enhance insulin signaling to attenuate the development ofinsulin resistance. The enhanced ROS-dependent insulin signaling is attributableto the oxidation and inhibition of PTEN. In patients with traumatic braininjury, nutritional status may result in changes in the biochemistry indicators.Curcumin, retinoic acids, and n-3 PUFAs are considered to exert the effects atseveral cellular levels. In addition, diet usually consists of complexcombinations of lipids or nutrients that might act synergistically orantagonistically. One of the pleiotropic properties of these foods could explaintheir disease-protective potentials, which could be mediated through modulationof PI3K/AKT/PTEN pathway. As PTEN is induced by the activated PPARs, this mayalso offer a potential therapeutic modality for the treatment of thosePTEN-related diseases. These key molecules may be regulated at multiple levels,including transcription, protein stability, and phosphorylation. So, preciseunderstanding of these regulations is crucial for therapeutic intervention andthe effective design of novel therapeutics. In addition to showing theantioxidant strategy of scavenging the initiating radicals in the injured braintissue, recent work has shown that carbonyl scavenging compounds can also act toprotect cellular proteins. Further mechanistic studies are needed in order toelucidate the precise molecular mechanisms and to determine whether an adequatedietary intake is related to improved brain function and to determine the roleit plays regarding the preservation of brain health. Long-term clinical studiesare obligatory to enlighten the effect of treatment in the management oftraumatic brain injury. This article is part of a series on Traumatic Brain Injury, edited byRobert Stern. Other articles in this series can be found athttp://alzres.com/series/traumaticbraininjury. This work was supported by grants-in-aid from the Ministry of Education, Culture,Sports, Science and Technology in Japan. In addition, this work was supported inpart by the grant from Nakagawa Masashichi Shoten Co., Ltd.